Steven Shaw, 26, allegedly posed as a police officer to extort a man out of an undisclosed amount of money. WINDHAM — Windham police said Friday that they have identified the man who is accused of posing as an undercover sheriff’s deputy to get money from a man last month. 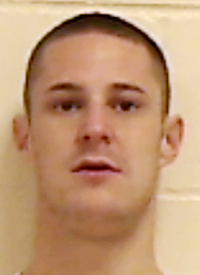 Steven Shaw Jr., 26, who is from the Waterville area, is wanted by several agencies in southern and central Maine on charges of burglary and theft, said Windham Detective Raymond Williams. The warrant for his arrest was issued last week. Shaw now is charged with one count of theft by extortion, which is a felony, and one count of impersonating a public servant, a misdemeanor. The victim told police on Nov. 21 that a man had come to his door the previous night claiming to be an undercover Cumberland County sheriff’s deputy. He told the victim that he would be arrested unless he gave the man money, police said. The victim said the man looked familiar but he did not know his name. Williams said the two had met a couple months earlier. The victim drove the suspect to a TD Bank ATM in North Windham, where he withdrew an undisclosed amount of money. The victim then dropped the suspect off near Lampron’s Mini Mart on Route 115 in Windham, police said. Media coverage of the incident and a security photo taken at the ATM led to tips that identified the suspect, police said. Williams said police take the impersonation charge very seriously. “We’re out there to protect the public, and we can’t have people out there pretending to be us” damaging the public’s confidence and trust, he said. Theft by extortion, one of the new charges, means taking someone else’s property by threatening that harm will come to them if they don’t comply.